Sometimes a new piece of music drops in your lap and even before taking the CD out of the sleeve you have a really good idea of what to expect. 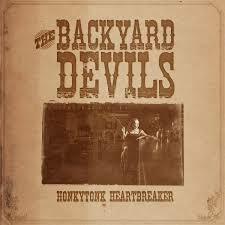 Honkytonk Heartbreaker by Canadian band The Backyard Devils fits so comfortably into that category that my job here is almost surplus to requirements. Initially put together by brothers Erik and Remi Arsenault they quickly added Chris Belliveau and Dillon Robicheau and released their first album in 2011 to much acclaim and recognition of a significant emerging talent. To quote the band, they have spent the subsequent years raising hell with their foot stomping music ever since. This is high tempo bluegrass that allows four extremely talented musicians to display an energy and passion for their music that never lets up throughout the 13 mostly self-penned tracks here. Gravel throated vocals from lead singer Erik vie with some brilliant playing. It is always a tad unfair to pick out individuals from a great band but special mention for the mandolin and banjo of Dillon which stands out from the very first track, Ramblin, setting a theme of girl trouble and hitting the road that is revisited throughout the album. Amongst the up-tempo foot stomping that makes up the majority of the album there are a couple of breathers; Cowboy, has a more country, laid back feel to it with its musings and meanderings conjuring up an image of the lone rider amidst the dusty wild west that, thanks to the legacy of a generation of filmmakers, we can all visualise perfectly. Feeling Stoned allows Erik to really put the blue in bluegrass with his lament of a love lost and the regret that may or may not come from the wisdom that the bottom of a bottle of whisky brings to the thought process. All I Want to Do could have been written for Raul Malo to belt out with The Mavericks and stands out as a highlight with its rousing chorus, swing time feel and, despite its measly 2:39 playing time, still allows time for some brilliant individual mini solos from all band members. It is a stand out track that showcases all the talent on display in this band.